How cool are dinosaurs? Spain is one of the richest areas in the world for dinosaur remains, and has devoted many museums and theme parks to their ancient predecessors. If you and your family love dinosaurs, come to Spain for a daring adventure. How cool are dinosaurs? We loved the film Jurassic Park, and who could resist Rex, the shy Tyrannosaurus rex from Toy Story? People have always had a fascination with these magical creatures and Spain is no exception. In fact, Spain is one of the richest areas in the world for dinosaur remains, and has devoted many museums and theme parks to their ancient predecessors. If you and your family love dinosaurs, come to Spain for a daring adventure: 1,945 miles of unparalleled dinosaur discovery. Over the last decade, paleontologists in Europe, especially in Spain, have found many new bone caches, including some of the largest and most complete dinosaur remains ever unearthed. Many believe that one of the best areas is in the region of Aragón. Therefore, located in the capital of Teruel Province, Teruel, is one of the largest museums of paleontology in the world, Dinópolis. Territorio Dinópolis has six other centers and a research and conservation foundation with the Aragón Government called Fundación Conjunto Paleontológico de Teruel-Dinópolis. Throughout the years, the Fundación has been finding new remains and they continue to document their findings for the public to see. In 2003, Dr. Rafael Royo-Torres and Dr. Alberto Cobos, paleontologists from the Fundación, were prospecting and surveying sediments in Riodeva as the local people were renewing the soil for farming. I met with Dr. Royo and spoke about his exciting finding of over 1,000 bones. ¨We both sat down on the ground and thought to ourselves, what is this?" said Dr. Royo in an interview. "The first bone we picked up was a falange [a phalanx, a bone from the toe of a dinosaur]. We took the falange back to Dinópolis to compare it against the other bones and realized that our finding was larger than the Brachiosaurus, which is over 24 meters long.¨ In 2006, the dinosaur was defined and named Turiasaurus riodevensis in the journal, Science. It was described as probably the biggest ever dinosaur found in Europe. In 2009, a skull was found half intact; but the other half had to be rebuilt. It took a team of paleontologists over three years with the remaining bones. ¨It was amazing and exciting to know that we made such a huge discovery,¨ said Dr. Royo. In April 2012, after years of research, the Fundación announced that the fossilized skull did belong to the Turiasaurus riodevensis, living over 145 million years ago and measuring 100 to 115 feet long. Luis Alcalá, Director of the Fundación, stated, "As paleontologists, we equally appreciate every new extinct species discovered. It doesn´t matter which kind of fossil has been found as each are an important step to complete the puzzle of the past biodiversity." Also in 2012, the Fundación discovered another new dinosaur in a coal mine called Proa valdearinnoensis from the Lower Cretaceous (lower Albian) in Ariño, Teruel. That same year, it was announced that a new type of dinosaur egg, Sankofa pyrenaica, was found in Lleida by paleontologists Nieves López Martínez from Complutense University of Madrid and Enric Vicens from Universitat Autónoma de Barcelona dating back over 70 million years from the Upper Cretaceous period. If you want to venture into the world of dinosaurs and take a journey through time, start in the capital of Madrid, one of the liveliest cities in Europe. Fasten your seat belt because you´re in for a ride! In Madrid, you can enjoy the city whose walls are made of fire. Start with a little education at the Museo Nacional de Ciencias Naturales. Founded in 1771, this museum is dedicated to minerals, fossils and the evolution of man including a spectacular permanent exhibition that concentrates on the history of life on Earth. The exhibit includes fossils and dinosaur skeleton casts such as Stegosaurus stenops, ¨Dippy¨ Diplodocus carnegiei and Australopithecus afarensis. 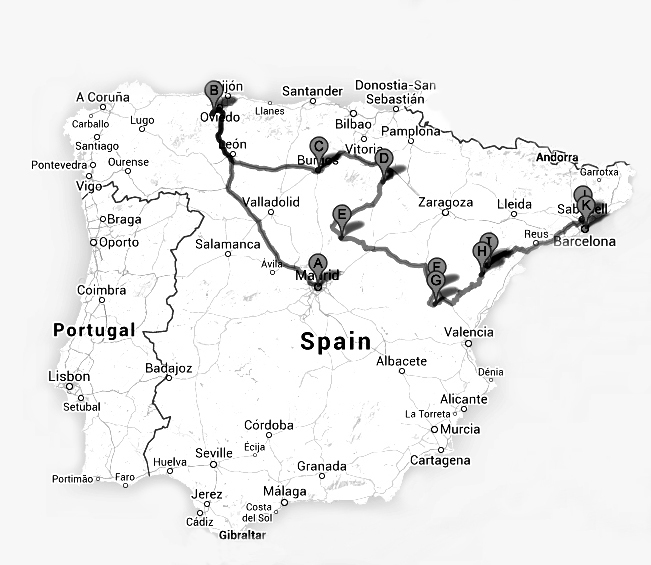 The next stop is a bit of a journey from Madrid, but the five-hour drive is well worth it. Asturias is well-known for its beautiful beaches and as ¨The Dinosaur Coast.¨ Museo del Jurásico de Asturias (MUJA) is known to be one of the most extensive dinosaur museums in Europe. The building is shaped like a dinosaur footprint with spectacular views of the Cantabrian Sea and the quaint fishing village of Lastres. The museum specializes in the entire Age of Dinosaurs: the Triassic, Jurassic and Cretaceous periods. Scattered along the beaches from Gijón to Ribadesella are fossilized dinosaur footprints from 150 million years ago. Make your way southeast and you will find a city called Burgos in the municipality of Salas de Los Infantes. There is a collection of dinosaur remains in the Museo Arqueológico y Paleontológico de Salas de los Infantes. You will find skeleton bones of the Demandasarus, which traces back not only to Europe, but Africa and South America. Additionally, you will see crocodiles, turtles and fish remains from the Age of Reptiles, Mesozoic period, about 125 million years ago. After Burgos, travel to Enciso in the autonomous community of La Rioja, a well-known area among paleontologists for remains. El Barranco Perdido hosts a museum of paleontology where visitors can learn about the dinosaurs that once lived in La Rioja during the Cretaceous times such as the Iguanodon, Deinonychus, Ouranosaurus, Psittacosaurus and Hypselosaurus. There are life-size reproductions, documentaries, children´s workshops, interactive games and a 3D recreation of a journey through time. New to the museum is an adventure water park where children can listen to the echoes of dinosaurs while swimming, zip-lining, and climbing a rock wall. From Enciso, travel to Galve in the region of Aragón, which is one of the richest areas of dinosaur remains in all of Spain. For dinosaur enthusiasts, this region must not be skipped. In Galve, the Museo Municipal Paleontológico de Galve explores the dinosaurs that populated the region between 150 to 120 million years ago like the Aragón plant-eating lizards Aragosaurus, Galveosaurus and the basal ornithopod dinosaur Gideonmantellia. At the Parque Paleontológico de Galve, you can take several routes to find replicas of dinosaurs and deposits such as Las Cerradicas and the Alfambra River Route where some real scale reconstructions of the Iguanodon and the Aragosaurus can be found. Also in Galve, you will find Dinópolis Legendark, one of the seven museums in the Territorio Dinópolis. The main attraction here are the original bones of a unique sauropod dinosaur that were found in the village, Aragosaurus, along with life-size replicas of its entire family. Living nearly 125 million years ago, the Aragosaurus weighed over 20 tons. Additionally, the museum has the original remains of two other dinosaur species, Hypsilophodon and Iguanodon as well as a laboratory where you can learn how paleontologists restore remains that are found. While all this whets the appetite, it's the Dinópolis Teruel museum and main park in Teruel that truly astounds. With one of the largest and rarest collections of dinosaur remains, it is also one of the most family-friendly. Here you can find a skeleton cast of Brachiosaurus (Giraffatitan), one of the largest dinosaurs from Africa at 24 meters long and 12 meters high. You can also see the original bones of the Turiasaurus riodevensis, the dinosaur discovered by our old friends, Dr. Royo and Dr. Cobos. This museum has something for everyone, taking people back in time from the Big Bang to present day. It has a paleontology museum with fossils from around the world, a laboratory where visitors can watch real scientists working, a recreation of the T-rex using a Japanese animatronic, Terra Colossus, which is a 4D Virtual Simulator, and ¨The Last Minute,¨ which is a boat ride from the disappearance of dinosaurs through the origin of Homo sapiens. Once you've caught your breath, it's time to head to Riodeva, which features the newest Territorio Dinópolis museum, Dinópolis Titania. It opened in 2012 and has a full-scale front half skeleton cast of the Turiasaurus riodevensis. Here you can also find the other dinosaurs who lived with Turiasaurus. Riodeva is also dedicated to Gigantismo, the World of Giants, like reptiles and large dinosaur and bird eggs. Winding down your trip back in time, you'll arrive in Morella for the fascinating permanent exhibition of Temps de Dinosaures, located in the Comunión de la Iglesia de San Miguel. The fossils here date from the Upper Jurassic (146 million years ago) to the Lower-Cretaceous period (just 98 million years ago). In Peñarroya de Tastavins at Dinópolis Inhóspitak, the staff will share stories about the excavation of the most complete sauropod that lived over 120 million years ago, Tastavinsaurus. This plant-eating dinosaur was found in 1996 and a large replica is now on display. Lastly as you head towards Barcelona, visit the Institut Català de Paleontologia Miquel Crusafont (ICP) in Sabadell, which is in the autonomous community of Catalonia. The institute focuses on the conservation of the paleontological patrimony of vertebrates and the team of experts handles all stages of paleontology. You can learn the stages of the scientific method process from finding a fossil at a site until the research is presented in a scientific journal. After 1,900 miles of dinosaur wonders, you may well be ready to return to the modern world. Barcelona, Spain´s second largest city, is there to welcome you after your long journey--but don't think you've left the land of dinosaurs behind entirely. Rumor has it, these gigantic terrestrial reptiles treaded those grounds, too! I hope you enjoyed the ride and look forward to hearing your stories of dinosaurs. Thank you for the contribution by experts Dr. Luis Alcalá and Dr. Rafael Royo-Torres from Fundación Conjunto Paleontológico de Teruel-Dinópolis. Tip: Before traveling, check that the museums are open as some do close from October until late March. To see more about Teruel, read my Huffington blog posts: Teruel Is Spain's City Of Love, Spain's Capital Of Amor Is A Valentine's Secret and Is Albarracín the Most Beautiful Village in Spain?.